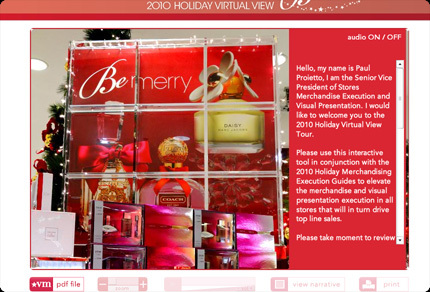 In Fall 2010, our team collaborated with Macy’s to develop our third virtual tour for the company’s stores, nationwide. 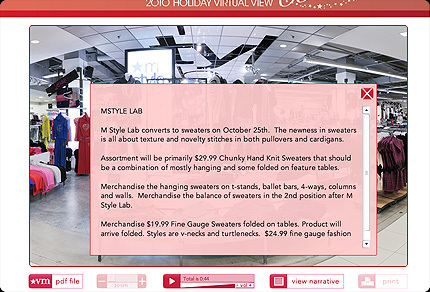 Virtual merchandising tools, such as our tour for Macy’s, aid store managers in maintaining a universal outlook and charm in all of their stores throughout the country, and they also serve as a valuable quality control instrument for company headquarters. Employee registrations with tools are fast and easy, and registration can be made mandatory to allow administration to track use of the resources. Our efficient update system allows users to make fast, easy corrections to a tour in a matter of minutes. Interactive maps are now a permanent feature of our tours, and users find the maps very useful for navigating store levels and locations. Instructional audio and text narratives also accompany all major displays within the tour. If a user prefers not to listen to any sounds, the “View Narrative” function will recall the text of the audio. Audio announcements are another excellent feature of our tours. This feature allows managers to transmit a message exactly as they desire it to be heard, eliminating any possible confusion or complications in communication with associates. 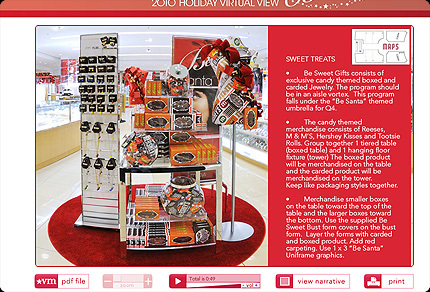 Various area-specific, downloadable materials are available through the “Features Menu” along the bottom of the screen for printout or in-store merchandising demos. High-resolution zoom also accompanies all panoramic scenes for superior image quality. 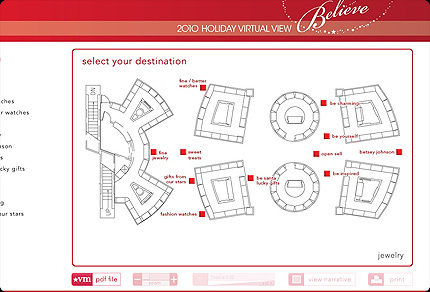 A tracking tool within the tour collects extensive feedback on the number of visits, average time of stay and unique individual feedback from users regarding usability, fun and their overall rating of the tour. Based on feedback provided by over 27 percent of visitors to this tour, the average rating for each of the aforementioned categories was an average of 4.75 out of 5. Over 72 percent of visitors spent more than 20 minutes on the site, and the tour had nearly 25,000 hits during its first month of operation. Video Clip: "What is Virtual Planogram?"